Keep medical marijuana safe and legal! June 6th was a nation-wide day of action to resist DEA assaults on medicinal cannabis dispensaries and patients. Actions were held in 55 U.S. Cities. In Madison, the action was coordinated by Gary Storck, communications director of Is My Medicine Legal YET? and Jacob Davis and Madison Students for a Sensible Drug Policy. Rick Harris of The Avalons plays Legal Medicine Blues for Jacki and others at the event. Rally and speakers at Noon City-County Bldg. at 210 Martin Luther King, Jr. Blvd. Madison WI for speeches by elected officials and others, then a march to the United States Courthouse at 120 North Henry Street, Madison, WI for speeches by patients and health care advocates. - Jacki Rickert, Patient, Activist, Founder of Is My Medicine Legal YET? 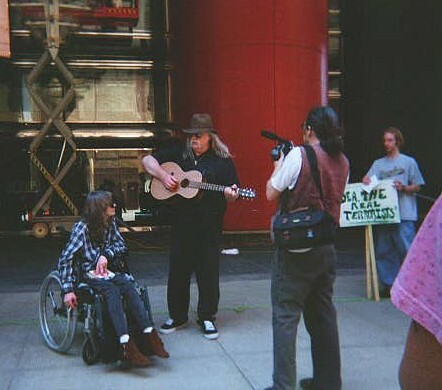 In addition, Rick Harris of the Avalons performed his song, "Legal Medicine Blues" at both the City County Building and the Federal Courthouse.